You’ve seen the warnings on those rolled up packages of raw cookie dough. Do not eat before cooking. For many of us, raw cookie dough was a rare treat growing up. We can remember sitting around the table while mom or dad mixed up a batch, eager to “clean out” the bowl when they were done. Unfortunately, concerns about E. Coli and other contaminants that have the potential to make us sick have prompted warnings about enjoying this indulgence. Maybe your parents even warned you way back then that it wasn’t a good idea. Recently, the Food and Drug Administration (FDA) has weighed in on this warning. In a public advisory released on June 28, 2016, the FDA warned that eating raw dough or batter—whether it’s for cookies or other baked items like bread, pizza, or tortillas—could make you sick. Talk about a downer, right? Well, we wanted to help. We’ve got more information about the potential dangers, some solutions to help keep your family safe and a tasty edible cookie dough recipe for you to try! So take a deep breath and relax. You don’t have to give up your favorite guilty treat just yet! Is Eating Raw Cookie Dough Unsafe? Though the FDA has only recently issued a public warning about the issue, contaminated cookie dough has been a concern for years. Back in 2011, for example, researchers from the Centers for Disease Control and Prevention (CDC) investigated a multistate outbreak of Shiga-toxin-producing Escherichia coli (STEC), a cause of bacterial gastrointestinal illness, or food poisoning. A total of 77 patients were sickened between March 16 and July 8, 2009, across 30 states. A total of 35 of these were hospitalized. They tracked the hospitalized cases back to their source and found that 94 percent of the patients had consumed ready-to-bake commercial prepackaged cookie dough. No other reported exposures were associated with illness. The researchers suspected that one of the ingredients used to produce the dough was contaminated—most likely, the flour. Surprised? You may have suspected the eggs, which can also be a source of contamination, but flour was the main suspected ingredient in this case. How is it that flour could become contaminated? Unlike many food ingredients, including pasteurized eggs, sugar, baking soda, and margarine, flour doesn’t go through a “kill step” to get rid of microorganisms and pathogens that might be present. These pathogens are killed during cooking or baking, but if you consume raw dough, you are exposed to any that may be present. Flour comes from grains, and these are pulled directly from the field without being treated for bacteria or other contaminants. Whatever comes into contact with the grains outdoors could still remain once they are milled into flour. In fact, in the study mentioned above, researchers suggested that manufacturers consider using heat-treated or pasteurized flour in read-to-cook or ready-to-bake foods. Once the products are baked, they are no longer a threat. Baking kills any potential microorganisms that could make you sick. But don’t forget the eggs! They can still be a source of contamination as well. The FDA also warns parents of young children to be particularly careful, and to be aware of “play” clay that is homemade from raw dough. It’s often used at day cares or kindergartens, and though children may not necessarily eat it, they do handle it, and may then put their hands in their mouth afterward. Here are some safety tips to consider, to keep you and your family safe. Don’t eat commercially prepared (or standard homemade) raw cookie dough, cake mix, batter, or any other raw dough or batter product. Be sure to cook any products containing flour for the proper amount of time. Wash hands, work surfaces, and utensils thoroughly after contact with raw dough. Keep dough and flour away from other foods while cooking. Don’t expect gluten-free flour to be safer—it’s still made from crops that may be contaminated. Always keep raw dough products chilled as directed until baked. Enjoy raw cookie dough made by companies who use pasteurized eggs (or no eggs at all) and heat-treated flour. This is the type of flour used to make cookie-dough ice cream, for example, and is considered safe to eat. To make your own safer cookie dough, use heat-treated flour (or other types of flours such as oat) and pasteurized eggs. 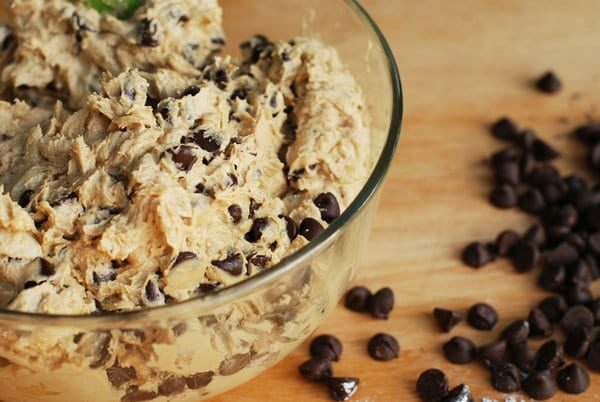 Here is a safe edible cookie dough recipe made with oat flour. We got this recipe from Show Me the Yummy. It looked so tasty we just had to share it with you! Cream together softened butter, sugar, brown sugar, vanilla, and milk until fluffy, about 60 seconds. Beat in oat flour and salt. Once combined, stir in chocolate chips. Serve immediately or store in the fridge, covered, for later! Place about 2 cups organic old fashioned oats in food processor. Process until it resembles fine flour. Measure out 1 and ½ cups and proceed with recipe above! Do you avoid eating raw cookie dough or do you have a recipe of your own? Please share your thoughts. USA Today – Is any cookie dough safe to eat? can you actually bake this dough and get good cookies? Nice to have recipe but nowhere does the email provide baking instructions. All of my chocolate chip cookie recipes have different baking temperatures and time. Thank you! We’re looking into this and will update the article asap! I will definitely try your recipe. I make mine with blanched almond flour and coconut oil. Wouldn’t oats or oat flour have the potential to be contaminated unless heat-treated also? Is there a difference in contamination levels depending on if the fllour is from organic wheat or not? I think just about every adult grew up eating raw cookie dough. That was half the fun of making cookies! Several years ago I switched to a healthy recipe designed specifically to be eaten raw. When I originally read the email and saw there was a different recipe, I was excited. Variety is the spice of life after all. 🙂 Given everything I know about your company, though, I was extremely disappointed when I saw the actual recipe with all those processed ingredients, especially the sugar. If you’re going to say you shouldn’t put toxic ingredients on your face, why would you suggest we put them in our bodies? 🙁 A much healthier and less toxic version would leave out almost everything you suggested and use things like almond or coconut flour or even healthy protein powder and be sweetened lightly with local raw honey. Posting recipes like this seem to go against the basic fundamental values of your company. It’s a treat. Treats are to be eaten sparingly and in small amounts. These are not ingredients that should NEVER be eaten, or that will cause any harm in most people in small and responsible amounts. I would not make this recipe it contains processed sugars and oats which are a grain and I can’t eat grains in any form. Here is a website for substituting sugar, hope you find it helpful. I grew up eating raw toll house cookie dough and I’m here to tell about it! But funny you should mention this…lately I’ve been making my own concoctions of nut butter, coconut oil and coconut flakes, with some choc chips thrown in for good measure. It tastes like cookie dough but is actually packed with nutrients. I pretty much wing it, but I’m going to be figuring out some actual measurements and posting on my happy, healthy and hot website soon. We all deserve to look and feel amazing, and have fun doing it. Love your products and love how you share so much valuable information.